Frédérik Robert has been passionately training singers across Canada for nearly two decades. He is also in demand as a vocal teacher, adjudicator, performance coach and music career mentor. Mr. Robert has a diverse and eclectic voice studio with singers ranging from musical theatre performers, to opera and R&B singers, to film/tv actors and Juno Award-nominated artists, to pop and rock singers. 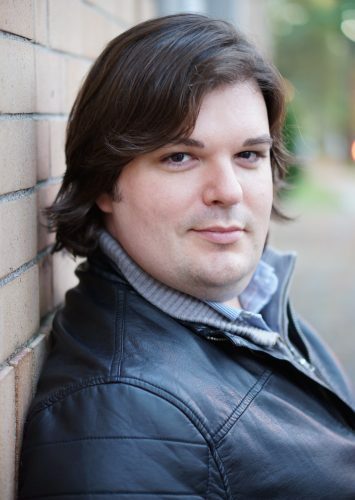 In addition to his thriving voice studio at the Vancouver Academy of Music, Mr. Robert is also the Program Coordinator for VAM’s Musical Theatre training program. Many of Robert’s students are enjoying busy performance careers with outstanding companies like: The Arts Club, International Gilbert & Sullivan Festival, Chinese Broadcasting National Orchestra, Vancouver Opera, Patrick Street Productions, Theater Under the Stars, Opera Mariposa, United Players, Gateway Theater, Renegade Arts Company, Fighting Chance Productions, North Shore Light Opera, Burnaby Lyric Opera, and Royal City Musical Theater. Other noteworthy student accomplishments from Frédérik’s studio include: Several Juno Award nominations, Mr. World Talent Competition 1st Place – London, England, Best Actress Toronto Theatre Critics Award, XFactor USA live appearance, Canadian Idol Top 10 Finalist, Barbara Clague Competition 1st & 2nd Place Winners 2018, Kiwanis Festival Provincial – Musical Theatre and Classical Voice, Port Moody Idol Champion, Tri-City Idol Champion, Youth Talent Showdown Champion, Lougheed’s Got Talent Champion, PNE Star Discovery Finalist. Vancouver French Canadian tenor Frédérik Robert has performed with Vancouver, Calgary, Edmonton and Saskatoon Opera companies. In concert he has been featured as a soloist with wonderful companies like: the Winnipeg and Regina Symphonies, National Arts Center Orchestra, and Vancouver Symphony Orchestra. As a cross-over artist, Frederik has sung leading roles in musical theater/theater productions with: the Arts Club Vancouver, BC Living Arts, The Show Co., Out of the Box Theater Productions, and Discovery Playhouse. As a member of the Canadian Tenors and Romanza Tenors, Frederik toured across North America for nearly ten years, performing in such prestigious venues such as the Venetian Room San Francisco. Recent performances include: Verdi’s Requiem, Rachmaninoff’s The Bells, Carmina Burana with Vancouver Bach Choir. The Lost Operas of Mozart (City Opera Vancouver), Dragging Piaf (Queer Arts Festival), Messa di Gloria (West Coast Symphony), A Night in Rome (Vancouver Symphony), Eva’s Brother in Evita (Vancouver Opera), Stickboy title role (Vancouver Opera workshop), L’araldo reale in Don Carlos and Spoletta in Tosca with Vancouver Opera. Mr. Robert has been privileged to study with notable teachers and coaches including: Virginia Zeani, Heidi Klassen, Carol Isaac, Nico Castel, Judith Forst, Michael McMahon, and Wendy Nielson.